This year, the weekend of 24/5 November saw the CQWW CW contest. Although CUWS normally enters the SSB version only, my Morse has been progressing steadily and I felt finally ready for a contest…what better opportunity? Since the VP2MUW team of experienced CW ops was returning hours before the contest began, and since in any case I thought building a team to disappoint with my beginner’s operating was a bad idea, I entered the single-operator category from Woop Woop 3. As a relatively recent licensee, receiving my M0 call in early 2017, I was also eligible for the ‘Rookie’ overlay category. Having set up WinTest for the contest in advance and checking I knew at least vaguely how to drive the shack’s Winkeyer, I left things until Friday; unfortunately, I still had rather a lot of work to do over the weekend, so clearly could not go in for a serious 30+hour stint. I elected to aim for about 10-12 hours operating over the weekend, and chose to enter the 20m QRO class. I arrived at the shack (later than I would have liked) at around 0845 on Saturday, and began by working the numerous multipliers in Asia before propagation in that direction died; after a couple of hours including my first attempt at running in a contest (at 26wpm or so, extremely leisurely by contrast to some ops—TI7W, for example was running at 43wpm), I decided to go and buy myself a sandwich lunch while waiting for the US path to open properly. On my return, I had a cup of tea and got back to work, soon managing a reasonable run of US stations interrupted only occasionally by frequency-snatchers, only some of whom were warned off with an insistent “QRL QRL”! I returned at greyline time on Sunday morning to work a few more mults/JAs; in the former I was largely unsuccessful, finding no new zones but a few new countries, but I managed to run through around 50 stations, comprised of many Russian/eastern European stations and a few calls from further afield, including JA. Hand keying for some partials and abbreviated CQs etc (which I never got round to programming in) via a Bencher paddle connected to the Winkeyer. FT1000MP with 250Hz filters. DSP minimally used. Logging was largely successful, though I made a few keyboard errors. Sending exchanges, most callsigns and some partials via Winkeyer. Some partials etc by hand. Running in a contest…it’s stressful but not as bad as I’d feared. Copy accuracy: I was able to copy about every other callsign on the first attempt, even at only 27wpm or so. Most callers were considerate enough to slow down to this speed, though a few attempted to work me at >>35wpm (I feel I can estimate this fairly well since I will happily call people QRQ if they are running fast, especially given the predictable exchange in CQWW DX). One or two succeeded. I found myself sending lots of partials. Predictable given my inexperience and rather as I’d expected—sorry to those whose rates suffered from my ineptitude! Hand sending: it’s improving, but I am still prone to make errors when sending by hand at 28wpm (I think I’m slightly better, at least with some messages, at higher speed). On several occasions I released the key too early when sending a short CQ, thus sending “M0W” (three men went to…), so had to correct myself. I also seem to struggle unnecessarily with the humble question mark: never have I sent so many ..–. . or similar! Run technique to some extent: this was mostly due to the copying issue. Lack of experience once again largely to blame. I was very confused until after the contest by people whose callsign I had thought I’d copied correctly sending some unexpected characters before the exchange; now I realise this was probably “UR”. I was also not always able to establish when I had copied callsigns correctly; credit due to those who patiently sent “N N” when I had it wrong, and “R R” when I had finally cracked it, but less to those who gave their exchanges even though I had not sent their full callsign and then disappeared! Winkeyer occasionally: for some reason, every so often, the keyer speed appeared to jump quite dramatically. I suspect this may be due to the interesting idea of speeding up to send “5NN” as quickly as possible, and somehow periodically failing to slow down again… problem easily solved by wobbling the potentiometer on the front though. Raw score was 139,050, though I am sure the error rate will be startlingly high (for reasons outlined above). Hopefully I should at least finish with a positive score! Raw score places me 78/145 worldwide, 59/88 in EU and 6/6 in G.
This entry was posted in Contests on 2018-12-13 by we229. 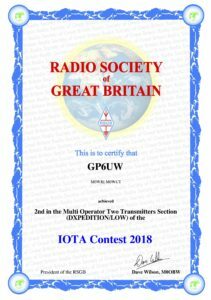 William Eustace M0WJE and Dan McGraw M0WUT entered the 2018 RSGB IOTA Contest from Guernsey. This was no cushy operation, however; the excitement began with the journey from the South Coast, made in a 24′ sailing yacht Aphrodite. I had brought the boat to Poole to allow a better slant on the anticipated SW winds; Dan and the non-radio operator (but keen sailor) Hugo Cheema-Grubb appeared on the quayside at varying times on the evening of 25 July, and all hands turned in—after figuring out how to stow themselves, a tent, a trestle table, two radios, four or five SOTA poles, power supplies, laptops, camping stools, Morse keys and all the other equipment required for a multi-two station in a very small space! Under sail off Old Harry Rocks at sunrise, shortly after leaving Poole. We slipped lines at 0330 and found ourselves off Old Harry Rocks by dawn. The crossing was in beautiful weather but much of it with remarkably little wind, so the deafening roar of the 4hp 2 stroke outboard featured for some hours, and those sitting in the cockpit donned their ear defenders. That evening, Aphrodite arrived at Braye, Alderney—thanks to a tidal miscalculation, just after sunset. After a leisurely breakfast the next morning, the tide was just turning in “the Swinge”, the mildly terrifying gap between Alderney and the off-lying islets, as we set sail once again. The wind was more obliging today, though predictably on the nose, and, helped by the notoriously rapid Channel Islands tides, we reached Guernsey largely under sail. Beaucette Marina’s boatyard was the operating location chosen, and, when the skipper had recovered from the excitement of the very narrow entrance, the QTH was surveyed: a majestic spot on the cliffs of Guernsey, looking out towards Herm and Alderney. The take-off to Europe was undeniably good, and proximity to salt water combined with ample space for antennas and the operating tent appeared promising. The weather forecast for the contest weekend, with winds frequently up to gale force and the occasional bit of heavy rain on Sunday, filled us with less enthusiasm—though at least it assured us that the conditions would not risk our feeling unadventurous. Starting at 0700 on contest day 1, Saturday 28th, we began pushing the gear in trolleys up the steep pontoon ramp and then heaving it up the mud bank onto the cliff. This seemed minimal in difficulty then; by the next morning it was to assume quite a different complexion. The tent was erected in the rising winds, and well guyed; with the help of Paul GU4YBW and Adam MU0WLV, we raised our 20m and 15m antennas, set up the trestle table and equipment within the tent, and, at 1300 (the start of the contest) were [almost!] ready to begin operating. 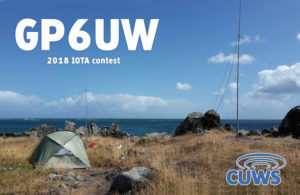 At the start of the contest exactly, Dan, the CW op, began sending the first of many “CQ TEST”s; as the SSB op, I tried to ensure that the frequency and mode were logged correctly (attempts to get the FT890 to speak to DXLog had failed), then began bellowing into the aether, with spectacularly little result. The “statistics” window grew progressively more depressing from my side, as the CW QSO count mounted rapidly in the marginal conditions. After some time, the SSB rate needle lethargically levered itself away from the stop, but not by much. 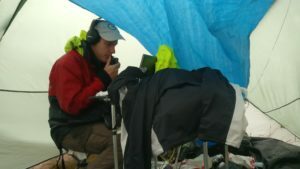 Dan meanwhile was running at a fine rate, occasionally clasping his hands over his earphones in an attempt to resolve an indistinct number or callsign—and perhaps in the hope of reducing the audio frequency power output of his fellow contester across the tent. Hugo had spent the day exploring the island, and helpfully provided a much-needed and delightful dinner. We abandoned the cliffs for an hour or so to eat, washing down the food with the local Roquette cider that Adam (MU0WLV) had thoughtfully delivered as “contest juice”—or Roquette fuel, as he termed it! Dan, complaining that there were “lots of dots and dashes going round and round in my head, and they all hurt”, made the sensible decisions to retire until 0600 the next morning, given the entry appeared to stand little chance of being competitive; I, being more foolhardy, returned to my three-legged stool and continued shouting into the void. Special thanks to the cheering QSOs with Bernie, W3UR, who worked us on SSB on a couple of band slots—the latter at roughly 0400 LT, in which he presciently asked how the tent was coping with the gale force winds. As it banged, flapped and slatted around my ears, I assured him all was well; as the sun began to stain the sky I made a foray outside to re-erect a partly collapsed antenna, but was pleased to note there were no other casualties. Despite running for at least six hours more, conditions (between local QRM from boat battery chargers, QRN, and generally poor propagation) were hard and 100W of voice went nowhere—I was now, finally, creeping up on Dan’s QSO count from the previous day. At about 0430 it began to rain outside, which presented little bother; unfortunately by 0530 it had begun to rain inside the tent as well, and operating became somewhat more challenging. By 0555 the situation had worsened to the point of being hazardous, and, covering all the equipment with oilskins, I QRX-d just as Dan arrived for the morning shift. Fetching more oilskins and packing away the most valuable equipment, operating resumed for a time, now on one rig only; I was pleased to note that Dan grimaced at the conditions on SSB, suggesting it wasn’t only my inadequacy causing such a pathetic rate, and, as the leaks intensified and a lake on the groundsheet developed alarmingly close to the mains wiring, we decided to go QRT for the contest (at risk of going QRT for good! ), on 742 QSOs, mostly on 40, 20, and 15m, with a few on 80m—though I had not bothered to erect the 80m dipole, the FT890’s tuner was quite able to cope with the 40m vertical on 80m, though of course the antenna was doubtless rather inefficient. As the rain poured into the tent, equipment was covered with oilskins and we scaled back to one SSB station. What, one might ask, of the other crew? Hugo had intended to explore the island that morning. A first hand account from Dan reveals that he rolled over at 0600, silenced his alarm, heard the rain on the cabin roof, remarked “No” and went back to sleep! All hands were soon rallied, though, and the equipment was vacated first to the (mercifully dry) campsite laundry room, then to the boat. After a refreshing few hundred yards’ stroll to admire a cliff fort and pass the time to 0900, we repaired to the restaurant, which had just opened, and had a well-earned Full English breakfast; that evening, the rain having abated, we were treated to a tour of a few of Guernsey’s highlights as unearthed by Hugo’s exploration, before patronising an excellent curry house in St Sampson—virtually the only restaurant in the area open on a Sunday evening. The accursed tent was stowed in the marina skip, and we set off for Alderney. From here, passage back to the UK was smooth and thankfully uneventful, though crossing the shipping lanes mid-Channel—likened by one watcher of an online AIS display to crawling across the M25—proved entertaining as always. 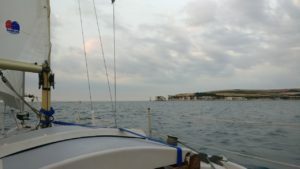 I dozed down below for a while, and in my absence a log entry reports “Playing Frogger with container ships.” We dropped anchor off Sandown, Isle of Wight at 0330 on 1 August, and pottered into Aphrodite‘s home port in Chichester Harbour later that morning, after some much needed sleep! Rigs were a Yaesu FT890 (kindly loaned by G3ZAY), and Dan’s Elecraft K3, used with paddle and Winkeyer. 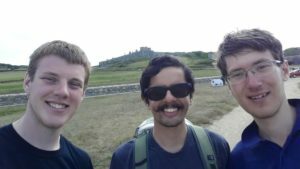 The crew had an afternoon ashore in Alderney to walk round some of the island. From left, M0WUT, Hugo Cheema-Grubb, M0WJE. This entry was posted in Contests, DXpedition, GU, IOTA, Trip on 2018-09-23 by we229.